The Clearing was a vision of the future in the grounds of Compton Verney Art Gallery, in collaboration with Alex Hartley. Together, we set out to build a physical place where people could learn how to live in the collapsing world that’s coming our way. From March to December 2017, The Clearing became part school, part shelter and part folly. 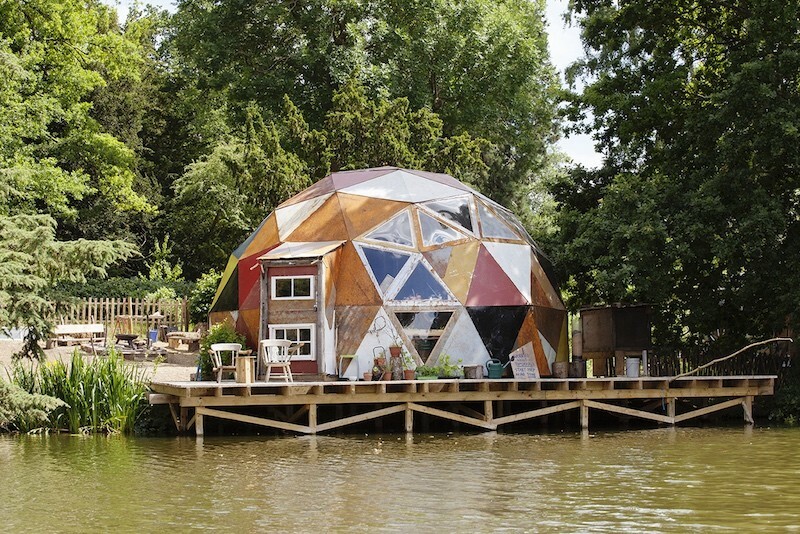 The Clearing took the form of an evolving encampment centred around a geodesic dome, built from reclaimed materials on the shore of the gallery’s lake. Inside the dome, a series of 20 workshops taught people just some of the skills they’ll need once the sea levels rise, the global economy collapses, and Big Sainsbury’s is on fire: from building fires and digging toilets, through making mead and working with wool, to building radios and rebuilding democracy. Outside of these workshops, a series of caretakers occupied the dome, to chop wood, feed the chickens and keep the vision alive. You can read more about their experiences here. The aim throughout was to help people step outside of the current world and feel what climate change might feel like. The Clearing was a reflection of the ambivalence we feel towards the future: half melancholy, half optimistic; half funny and half sad. The Clearing will stand in the landscape for a further two years, as a useful ruin, and a reminder of the folly of the world to come.